Sopa de albóndigas is one of those comfort foods that bring back memories of my homeland. My mom always adds potatoes, carrots, chayotes, or some sort of vegetable into the tomato broth to make enough for a large family like ours. And it is a good way to get the kids to eat their veggies. The taste of mint in this dish is essential. I am updating the pictures on this Soup, it was published in April 2009. 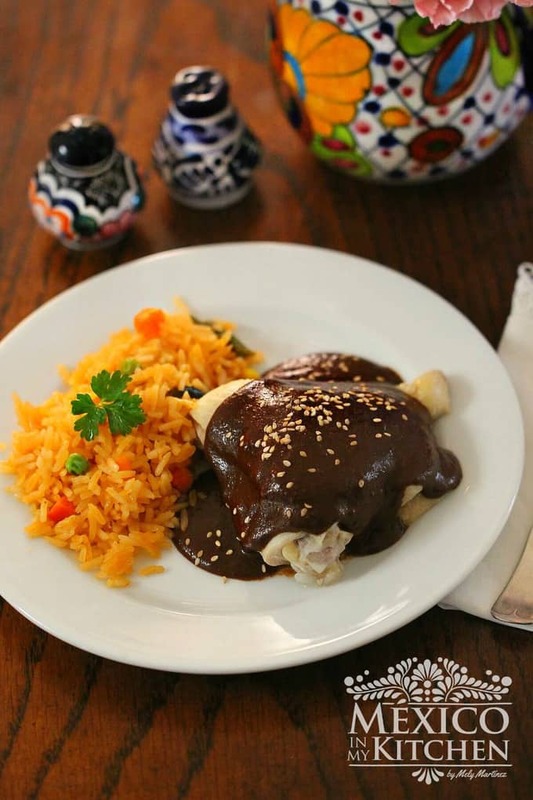 This recipe is adjusted from the book The Cuisines of Mexico by Mrs. Diana Kennedy, published in 1972. 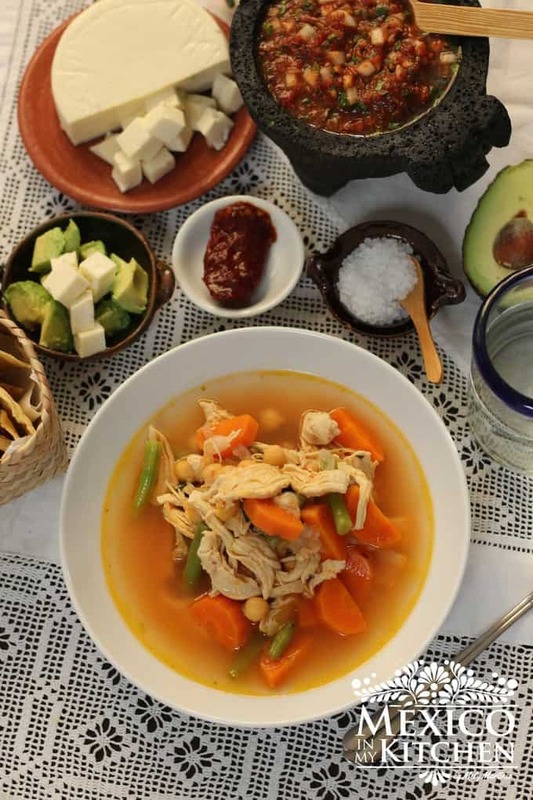 In her book the name of the recipe appears as: “Albondigas de Jalisco”, and as she has mentioned, every region has its own recipe and my guess is that everyone will say: “my mom’s albondiga’s soup is the best”. This soup is great to have for the cold weather that seems like it will stick around here for a little longer. It will make you want to go back for a second plate, but refrain yourself from doing so and freeze some for later on. You’ll be glad you did! 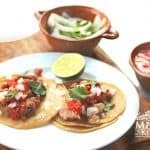 En Español you can find a very similar recipe in Gusta Usted?, a cooking blog from my friend Nora in Mexico. 2. Trim the squash and chop them very finely. Add the squash and chopped onion to the meat. Blend the eggs with the herbs and spices until smooth. Mix well into the meat. Add salt. 3. Drain the rice and add it to the mixture. Make 24 meatballs, each about 1-1/2 inch in diameter, or any size of your preference. 4. Pour the boiling water over the tomatoes and cook it for about 5 minutes.Skin the tomatoes, place them in the blender along with the chopped garlic clove and blend until almost smooth. 5. Heat the oil and cook the onion gently, without browning, until soft. 6. Add the tomato puree, bring it to boil, and let it cook fast for about 3 minutes. Add the broth to the tomato sauce and bring it to simmer. 7. Add the meatballs, cover the pan, and let them simmer for about one hour and 15 minutes to one hour and 30 minutes. Serve in deep bowls with plenty of sauce. Sopa de albóndigas is one of those comfort foods that bring back memories of my homeland. My mom always adds potatoes, carrots, chayotes, or some sort of vegetable into the tomato broth to make enough for a large family like ours. And it is a good way to get the kids to eat their veggies. Cover the rice well with boiling water and let it soak for about 45 minutes. Place the meats in a large bowl and mix well. Trim the squash and chop them very finely. Add the squash and chopped onion to the meat. Blend the eggs with the herbs and spices until smooth. Mix well into the meat. Add salt. Drain the rice and add it to the mixture. Make 24 meatballs, each about 1-1/2 inch in diameter, or any size of your preference. Pour the boiling water over the tomatoes and cook it for about 5 minutes.Skin the tomatoes, place them into the blender along with the chopped garlic clove and blend until almost smooth. Heat the oil and cook the onion gently, without browning, until soft. Add the tomato puree, bring it to boil, and let it cook fast for about 3 minutes. Add the broth to the tomato sauce and bring it to simmer. Add the meatballs, cover the pan, and let them simmer for about one hour and 15 minutes to one hour and 30 minutes. Serve in deep bowls with plenty of sauce. If you want to make this soup a little spicy add some sliced jalapeños to the simmering sauce. Or add some canned chipotles to the blender with the tomatoes. Fresh mint optional to add to the soup at the end of the cooking process. MELY! Me había perdido esta receta! Voy a leerla con mas detenimiento. Gracias por poner el enlace a la mía. Mejor me la llevo de una vez, se que está buenísima, rica y deliciosa! This is one of my favorite Mexican soups! I have found a "quick" method. Bottled chipotle salsa and beef broth for the soup. I also add the rice raw, since it cooks in the broth along with the meat. My Mexico City mother in law also taught me to push a small leaf of yerba buena into the center of the meat ball. Provecho! QUIERO ALBÓNDIGAS!!!!!!!!!!!!!!!! Qué ricas se me volvieron a antojar! Even though it's supposed to be "spring" here in New Hampshire, it definitely does not look like it. We are crazy for meatballs here and anything Mexican. This would be perfect to warm me up. It looks delicious, Mely! I am going to give this recipe a try, II have made albondigas before but the results were bland. I think yours has the right balance of spice, thank you for sharing! Hello Sheryl, This recipe in particular is from the Jalisco Area. Most recipes do not call for zucchini. Thank you for sharing this meatball recipe. I've made it twice and both my husband and I absolutely love it especially on gray, rainy days. It was sheer comfort food! Thank you for trying the recipe, and for taking the time to come back and leave a comment. So happy to know you and your husband liked it. Wonderful recipe! My family loved it all around! The mint made for a delicious twist! Do we boil the rice for 45 minutes or soak the rice? I’m a little confused. I made the other recipe and I would like to make this one. You soak the rice for 45 minutes, then you drain it. Okay, I made this recipe. How do you cook the rice in the other recipe? I’m sorry. I got confused with the other recipe.